A breathtaking landscape connects the two “pearls” of the Amalfi Coast: Positano, and its beautiful terraces overlooking the sea and Amalfi, with its combination of colors that create a unique spectacle. The Amalfi coast is a jewel waiting for you to discover it. A delightful sea ride, on board of a comfortable boat with a small group of 12 passengers, is the best way to admire the show that the coast offers: the sea and the mountain meet each other, creating a breathtaking landscape. You can explore the beautiful towns of Positano and Amalfi, swimming and snorkeling, and relax with an happy hour on the boat at the end of the day. What else? We are waiting for you! Pick-up from your hotel or from a designated meeting point and transfer to the port of Piano di Sorrento. Departure to Amalfi, sailing along the Sorrento coast. Along the way you will admire: the ancient fishermen village of Marina Grande, the ruins of a roman villa near Bagni della Regina Giovanna, the natural waterfall that flows from the rock, Ieranto bay and other interesting attractions along the coast. Departure from Positano to Sorrento with the final limoncello tasting. Return to the port of Piano di Sorrento and transfer to your hotel or to the meeting point. The price includes: Pick-up from/to hotel – Professional skipper English speaking – Appetizers – Alcoholic and non-alcoholic beverages – Equipment for snorkelling. The price does not include: Entrance fees – Lunch. Do not forget: Swimsuit – Beach towel – Sunscreen – Sun hat – Camera. Please enter here the name of the hotel. We will contact you prior to your tour to confirm pick-up point and time. If you have not booked your hotel or live locally please add these "notes". The name Ieranto derives from the Greek “Ieros” or “sacred” : here near Punta Campanella stood the temple of the Goddess Athena and here Homer placed the Sirens who enchanted Ulysse. Today the sacred atmosphere is still breathed walking on waves of rock, in front of panoramic views that open into a sudden blue. The Bay of Ieranto is a strip of land that stretches from the fishing village of Nerano to almost churning out Capri. Ieranto is now owned by FAI, the national fund for the environment, which often organizes guided tours. Access to the area is always free. Seen from above it looks like a dolphin, in reality Li Galli is a small archipelago formed by three islets that overlook between Capri and Positano. It is currently privately owned and can therefore only be visited by invitation, but the less fortunate can admire it from afar by boat. The archipelago consists of the Gallo Lungo (which is the largest island), the Rotonda and the Castelluccia. The whole area is part of the marine protected area of Punta Campanella. It is also known as the Sireneuse because according to legend it was once inhabited by mermaids, who enchanted the sailors in transit with their songs. Always according to mythology only two ships were able not to sink against the rocks: that of Ulysses whose story is told in the Odyssey of Homer and that of the Argonauts who saved themselves thanks to Orpheus. It is also said that the name Li Galli derives from the iconography of the sirens, that, in archaic greek art, are not half woman and half fish but rather half woman and half bird. The archipelago was discovered in the 1920s by Russian dancer and choreographer Massine. At that time Li Galli was covered by Roman ruins and was unhihabited and he made a villa there thanks to the architect Le Corbusier who also built a theatre. On his death, Li Galli was bought by a Russian dancer, Rudolf Nureyev, who had the dream of creating a dance school. His premature death prevented him to realize this dream and in 1988 the island remained uninhabited again. Now it is owned by an entrepreneur from Sorrento, who rents the residences on the island for private parties or receptions. Positano, the place where like the mermaids hosted on the island of Li Galli, never ceases to seduce those who come here. Positano seen from the sea looks like a shell, streaked with different colours. From the green of the Lattari Mountains, which crown it, to the white pink and yellow of its Mediterranean houses, the silver grey of its pebble beaches and, finally, the blue of its sea. On the coast of Positano there were beautiful villas during the Roman period, as evidenced by some remains at the Church of the Assumption. When in 1260 it was sacked by the Pisans, it changed its town-planning to a defensive end, becoming similar to Amalfi with narrow streets, houses climbing on the rock fortifications and watchtowers. From every point of the village you can admire the multicoloured majolica dome of the Church of Santa Maria Assunta, which houses the icon of the Black Madonna dating back to the eighteenth century. Curiosity: the name of Positano comes from the legend. It is said that the painting of the Madonna was on board a ship, which, because of the good wind, could not in any way resume the sea. The sailors at one point heard a voice saying “pose,pose” or “stop there, in that place” and that was how they approached the shore. The people of Positano, who gave the name to the town from this event, took the picture and brought it to the Church of San Vito, patron Saint of Positano, which no longer exists since ‘600. They left it there but in the morning miraculously the painting disappeared and was found near the sea, on a “mortella” tree. Thinking of a miracle because the painting had arrived in that place alone, the people of Positano began at that point the construction of the new Church dedicated to Mary Assumed. The village of Praiano, scattered between the coast and the mountain, offers inviting and peaceful beaches and above all here is the only beach of the Amalfi Coast illuminated by the sun until sunset. 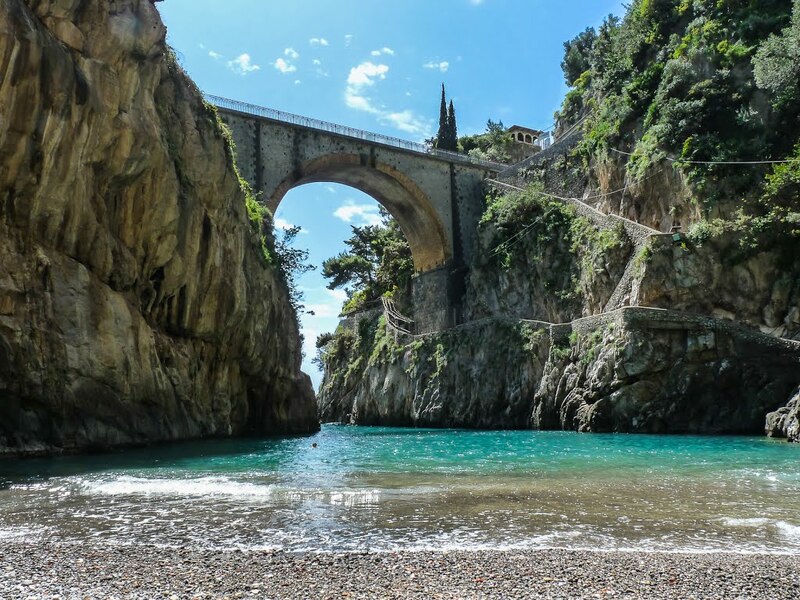 Bordering Praiano is the village of Furore, with its famous fjord where every year, on the first Sunday of July, there is a spectacular diving competition. 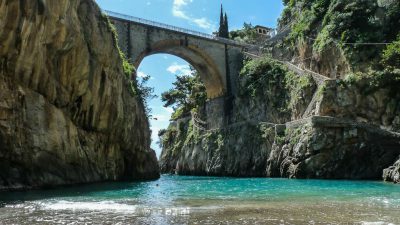 The Fjord of Furore is one of the most fascinating places on the Amalfi Coast. It consists of a deep crack in the rock and is crossed by the Schiato stream that flows fast from the Agerola plateau. These deep coves and overhanging rocks are typical of the landscapes of Northern Europe and also Furore takes on the typical connotations of those fairytale landscapes, but blending them with Mediterranean smells and atmosphere. As in every place of enchantment, here too there are legends. Local legend has it that the Devil himself went to Furore and the inhabitants, who did not like his presence, proved to be inhospitable with him. The devil then going away, thought of leaving a “memory” near Agerola, but by mistake he cleaned himself with the most aggressive of nettles and escaping screaming furiously slammed his feet marking that stretch of road. Historians say, however, that the town, formerly called “Terra Furoris”, takes its name from the sound of waves that crash furiously on the rocks of the small fjord. In the past the Fjord of Furore was home to factories where paper was processed and, going down to the Valley, there is still the old spreader where it was dried. Since 1997 it has been included in UNESCO as a World heritage site and has also recently joined the club of the “most beautiful villages in Italy”. According to a legend, the town takes its name from Amalfi, a nymph loved by Hercules who was buried here at the behest of the Gods. Surely inhabited by the Romans, who had fled to the Lattari Mountains to escape the Germanic and Lombard invasions, it was a camp for the defense of the Byzantine Duchy of Naples. The city enjoyed a privileged relationship with Byzantium for the ability of the Amalfi people in maritime trade. The unique architecture of white houses, the mild climate almost all year round and the characteristic craft shops make it a perfect tourist destination chosen by thousands of tourists. Amalfi is a city of about 7000 inhabitants, rich in history and art and gives its name to the Amalfi Coast, famous throughout the world and since 1997, declared a UNESCO World Heritage Site. Among the most famous monuments there is certainly the Cathedral of Amalfi in Arabic-Sicilian style dedicated to St.Andrew, patron Saint of the city. The Dome was built next to the oldest Basilica, which in turn was built on the ruins of a temple. The interior of the Dome, with its coffered ceiling, is characterized by a central nave and above, on the altar, there is the canvas of the Martyrdom of St.Andrew. Inside the crypt is the body of St. Andrew, the first disciple of Jesus and patron Saint of Amalfi. The Cloister of Paradise is part of the Cathedral of Amalfi, in fact from the atrium of the latter you can access one of the most famous and interesting buildings of the entire Amalfi Coast. Its construction dates back to the years between 1266 and 1268 as a cemetery for the illustrious and well-off citizens of the noble families of Amalfi and housed their sarcophagi. Amalfi and the Amalfi Coast await you with their pastel-coloured villages overlooking the blue, the inlets, the fjords, the mountain paths with unforgettable views, art, history and traditions and of course food and wine. We had a perfect day exploring Amalfi and Positano by boat. Our original day booked had to be rescheduled due to weather and Ilaria was beyond helpful getting this done - she called our hotel and worked with us! So glad we got to reschedule because this was the best day of our trip. Giovani was a great captain, the snacks on board were great, no complaints! 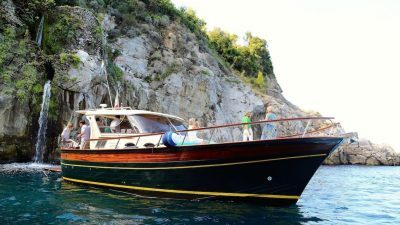 We used this company for a Amalfi and Postiano boat trip. I must say it is one of the best boat trips I have done. There was only 12 on the speedboat and Tony our skipper was brilliant. He showed us all points of interest which he slowed down for to tell us the info. He kept asking if we’re ok and we had drinks and snacks on our way home back to the marina. If in Sorrento again will definately used these guys. We booked a cruise of the Sorrento and Amalfi Coast through our apartment owner with this company. We had a fabulous day at sea. Visited Amalfi and Positano and swam in the water twice. Our kids loved their day on the boat. The staff was very helpful and well organized. I would recommend this company - it is well Worth the price paid. There was a long wait in the morning, prior to knowing what boat we were going to use, but we were in nice surroundings... so no big deal! The best boat trip of our holiday! Loved it. We booked a cruise trip via Thomson for 4 adults to Amalfi and Positano for the day. We were collected by taxi from our hotel at 8.30 am and driven to the harbour. We had to wait around for 40mins then our allocated boat driver welcomed us onto his boat with 8 other people. His name was Fonzi, he was the best; very informative explaining all the scenery and points of interests, best hotels etc. we were offered chips, soft drinks & wine. (very nice). We pulled into a beautiful cove, had a shower under a fresh waterfall, swam in the blue warm sea. Amazing!!!! We were left to explore amalfi for one hour and later Positano for 2 hours. Fonzi was so helpful, anything you required he provided, a fantastic sense of humour. The scenery, the boat, amalfi, positano, the sea, but most important Fonzi made the day the best we had all week!!!! We highly recommend this trip. We arrived back to Sorrento about 7.30 where a taxi was waiting for us. FABULOUS!!!! Cant wait to do it again next time I am in Sorrento. We used Youknowboat.com while vacationing in Sorrento. It is convenient, they have a driver pick you up at your hotel and bring you to the port. There we were met by the skipper who secured a self drive boat and tour even though the season was not yet open. I highly recommend this company over any other in the area. They are accommodating and reliable, we are using them again next year since it was the highlight of our trip. Tour to Capri, Ischia and Amalfi are an absolute must when visiting this area. 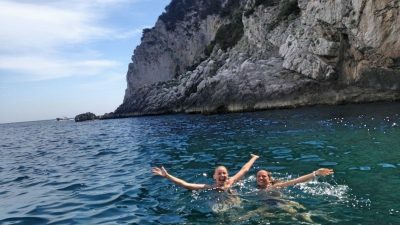 As a family we decided to do a group tour of the Amalfi coast by boat-what a great decision!!! Everyone enjoyed the day, Dario was a wonderful host/tour guide and the others on the boat couldn't be nicer!! This was hands down the best part of our vacation! We were a group of 9, that included two young children. Lisa was incredibly helpful in planning the day, she was quick to respond to emails and offered great advice for our itinerary. We can’t thank Federico and Giacomo enough for such a fantastic day! They made all nine members of our group feel like they were royalty. They were hospitable and couldn’t do enough to make sure we had a great time and felt safe - Federico was an amazing captain. Federico and Giacomo, who are local to the Amalfi area, knew the best spots to go, and had the best limoncello we had in Italy. Would highly recommend! We booked the Amalfi coast tour by boat through our hotel and this was the company we had our trip with. And what an amazing trip it was! We were picked up at hotel and taken to Piano di Sorrento to the small port. Staff at the desk were very friendly and spoke good English. We had the boat to ourselves, just 5 of us which added to the whole experience. We were married in Sorrento on the Saturday and had the trip on the Monday so it was a great wedding present having the boat to ourselves!! You can have up to 12 people on a boat. The boat was fantastic, exceptionally clean, comfortable seating both at the back and front and we had a great skipper too in the lovely Francesco! He was brilliant, chatty, accommodating, informative and was fantastic with our 4 year old Molly who he let 'drive' the boat!!!! We were treated to Prosecco, nibles and of course the famous Limoncello!!! The trip itself was simply amazing. We stopped for a swim in the sea, at Amalfi and Positano and the views were spectacular right throughout the day. 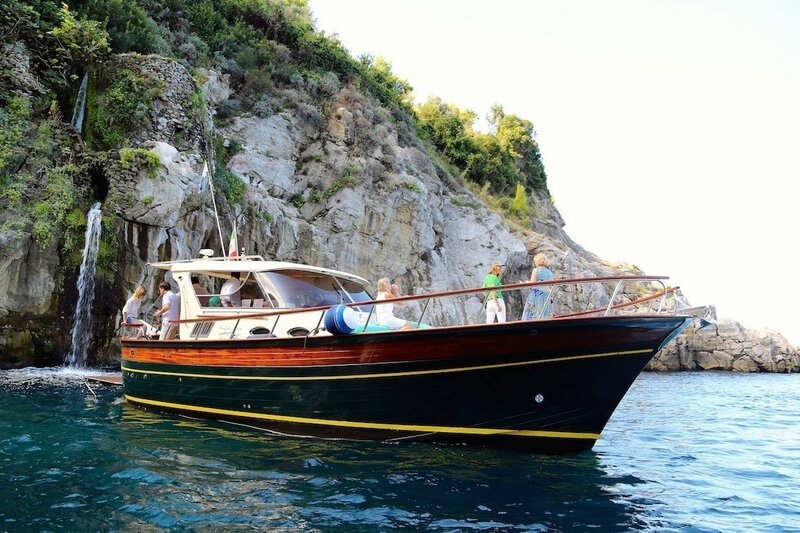 The Amalfi coast by boat is a must and we would not hesitate to recommend You Know Boat Excursions. Brilliant day, trip and memories. Cruise in small group (12 people on board), our skippet Luca was friendly and spoke a good english.We were offered refreshments during the whole day and were able to swim 2 imes in the sea in beautifull places. Fore me the best way to reach easily the 2 gorgeous villages of Amalfi and Positano who are very difficult to reach quickly by car. No stress,just enjoying the sea, the views . Pick up at our hotel, departure from the small port of Piano di Sorrento, we were guided by a welcomming person. The desk of "You know" is just in front of the boats. The people there speak several languages and are very kind. We had a wonderful day with the team at You Know! We booked our trip on Viator and read a number of great reviews there. The coordination of pick up was wonderful, we stayed at an Airbnb and was a bit worried pick up would be difficult. Not at all, we received an email with pick up time and location (5 minutes from our place) and was able to confirm via email (much easier while traveling internationally than a phone call). The boat was wonderful and our skipper was Thomaso. We were treated to gorgeous views of Sorrento and made our way through some beautiful covered spots in the water. With a quick stop to swim before continuing to Amalfi. It is a stunning day. The time on the shores of Positano and Amalfi was a bit short but the views we saw more than made up for it. Our skipper also stopped at a few spots on the journey back including a private beach with a huge bridge above it, a fresh water, water fall and a small cave. We have beautiful pictures and even better memories of our time with You Know! and their team. We also got engaged on their boat! They shared champagne with us for the trip home and had more bottles waiting when we docked again. We're still not sure if it was planned but when it was time to go we were brought back to our pick up point with 4 other guests on a boat direct to the Marina Grande it was a lovely touch either way :) Definitely a worthwhile trip!